This species is accepted, and its native range is W. South America to Brazil. Nativa en Colombia; Alt. 50 - 1550 m.; Amazonia, Andes, Guayana y Serranía de La Macarena, Llanura del Caribe, Orinoquia, Pacífico, Sierra Nevada de Santa Marta, Valle del Cauca, Valle del Magdalena. A large glabrous woody herb or subshrub up to 5 m. tall, rarely a tree 7–8 m. tall. Root tubers up to 50 cm. long, very farinaceous. Young shoots glaucous greenish grey. Leaves deeply palmatipartite, with 3–5(–7) lobes, rarely simple, shallowly cordate, sometimes slightly peltate, membranous-chartaceous, the lobes oblanceolate, occasionally lanceolate or obovate, 6–14(–17) cm. long, 1–6 cm. 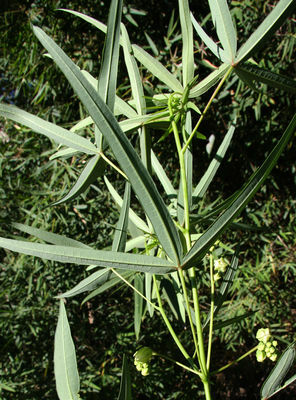 wide, acute, gradually acuminate, ± attenuate towards the base, entire, with up to 18 pairs of lateral nerves, midrib scarcely prominent above or beneath, dark green above, glaucous beneath; petiole (0–)5–13(–17) cm. long. Stipules triangular-lanceolate, 5 mm. long, setaceous-acuminate, ± entire, readily deciduous. Inflorescence paniculate, 8–11 cm. long; bracts resembling the stipules. Male flowers:pedicels patent-decurved, 5 mm. long, slender; calyx cylindric-conic in bud, campanulate, the lobes imbricate, triangular, 6 mm. long, 4 mm. wide at the base, subacute, glabrous without, sparingly pubescent within towards the apex, greenish, tinged orange and crimson and sometimes veined with purple, the tube 6 mm. long; long filaments 7 mm. long, short filaments 2.5 mm. long, slender, glabrous, white, anthers 1.5 mm. long, with a tuft of hairs at the apex, pale yellow; disc 10-lobed, concave at the centre, the lobes acute. Female flowers:pedicels somewhat decurved, 7 mm. long, extending to 2.5 cm. in fruit and thickening to 3 mm. ; sepals imbricate, triangular-ovate, 1 cm. long, 5 mm. wide, subacute, glabrous without, pubescent within near the margin; disc shallowly 5-lobed; ovary 2 mm. long, 2 mm. diameter, 6-winged or -angled, pink; styles botryoidal, 2 mm. long. Male flowers:pedicels patent-decurved, 5 mm. long, slender; calyx cylindric-conic in bud, campanulate, the lobes imbricate, triangular, 6 mm. long, 4 mm. wide at the base, subacute, glabrous without, sparingly pubescent within towards the apex, greenish, tinged orange and crimson and sometimes veined with purple, the tube 6 mm. long; long filaments 7 mm. long, short filaments 2.5 mm. long, slender, glabrous, white, anthers 1.5 mm. long, with a tuft of hairs at the apex, pale yellow; disc 10-lobed, concave at the centre, the lobes acute. Female flowers:pedicels somewhat decurved, 7 mm. long, extending to 2.5 cm. in fruit and thickening to 3 mm. ; sepals imbricate, triangular-ovate, 1 cm. long, 5 mm. wide, subacute, glabrous without, pubescent within near the margin; disc shallowly 5-lobed; ovary 2 mm. long, 2 mm. diameter, 6-winged or -angled, pink; styles botryoidal, 2 mm. long. Fruit ellipsoid-subglobose, 1.5–1.7 cm. long, 1.5 cm. wide, rugulose, 6-winged, the wings undulate-subcrenate, endocarp woody. Seeds ellipsoid, subpentagonal in section, 1.1 cm. long, 5.5 mm. wide, 3.5 mm. deep, pale grey, sometimes mottled, somewhat shiny, with a caruncle 3 mm. wide. A brittle-stemmed dichotomously branched shrub or small tree up to 5 m tall. Root tubers up to 50 cm long, farinaceous. Petiole 4–25 cm long, often reddish. Leaf blades 6–25 cm across, deeply palmatipartite, 3–7-lobed, rarely simple, shallowly cordate, sometimes very slightly peltate with 1–2 mm width of lamina below the petiole-insertion; the lobes usually oblanceolate, the median 6.5–15 × 2–6 cm, gradually acutely acuminate at the apex, narrowed at the base, entire, sparingly pubescent near the midrib or subglabrous, dark green above, glaucous beneath; lateral nerves up to 20 pairs. Stipules 4–5 × 2 mm, triangular-lanceolate, soon falling. Inflorescence 2–11 cm long, paniculate; bracts resembling the stipules. Male flowers: pedicels 5 mm long, slender; buds 2 × 1 mm, cylindric-conic; calyx lobes 6 × 4 mm, triangular, subacute, glabrous without, pubescent within near the apex, greenish, tinged orange or crimson and sometimes purple-veined; stamen filaments slender, the longer 7 mm long, the shorter 2.5 mm long, glabrous, white, anthers 1.5 mm long, with an apical hair tuft, pale yellow; disk 10-lobed, concave, the lobes acute. Female flowers; pedicels 7 mm long, extending to 2.5 cm and thickening to 3 mm in fruit, decurved; sepals 1× 0.5 cm, triangular-ovate, subacute; disk shallowly 5-lobed; ovary 2 × 2 mm, hexagonal, pink; styles 2 mm long, botryoidal. Male flowers: pedicels 5 mm long, slender; buds 2 × 1 mm, cylindric-conic; calyx lobes 6 × 4 mm, triangular, subacute, glabrous without, pubescent within near the apex, greenish, tinged orange or crimson and sometimes purple-veined; stamen filaments slender, the longer 7 mm long, the shorter 2.5 mm long, glabrous, white, anthers 1.5 mm long, with an apical hair tuft, pale yellow; disk 10-lobed, concave, the lobes acute. Female flowers; pedicels 7 mm long, extending to 2.5 cm and thickening to 3 mm in fruit, decurved; sepals 1× 0.5 cm, triangular-ovate, subacute; disk shallowly 5-lobed; ovary 2 × 2 mm, hexagonal, pink; styles 2 mm long, botryoidal. Fruit 1.3–1.7 × 1.3–1.5 cm, ellipsoid-subglobose, rugulose, 6-winged, the wings undulate-subcrenate, greenish. Seeds 1.1 cm × 5.5 mm × 3.5 mm, ellipsoid, depressed-pentagonal, somewhat shiny, pale grey, sometimes mottled, caruncle 3 mm wide. 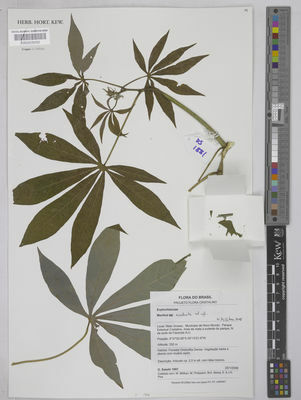 Jatropha mitis Sessé & Moc. Manihot esculenta var. argentea Cif. Manihot esculenta var. coalescens Cif. Manihot esculenta var. communis Cif. Manihot esculenta var. debilis Cif. Manihot esculenta var. digitifolia Cif. Manihot esculenta var. domingensis Cif. Manihot esculenta var. fertilis Cif. Manihot esculenta subsp. flabellifolia (Pohl) Cif. Manihot esculenta var. flavicaulis Cif. Manihot esculenta var. fuscescens Cif. Manihot esculenta subsp. grandifolia Cif. Manihot esculenta var. hispaniolensis Cif. Manihot esculenta var. jamaicensis Cif. Manihot esculenta var. luteola Cif. Manihot esculenta var. mutabilis Cif. Manihot esculenta var. nodosa Cif. Manihot esculenta var. pohlii Cif. Manihot esculenta var. ramosissima Cif. Manihot esculenta var. rufescens Cif. Manihot esculenta var. sprucei Lanj. Manihot esculenta var. zimmermannii Cif. Manihot flexuosa Pax & K.Hoffm. Manihot palmata var. aipi (Pohl) Müll.Arg. Manihot palmata var. diffusa (Pohl) Müll.Arg. Manihot palmata var. digitiformis (Pohl) Müll.Arg. Manihot palmata var. flabellifolia (Pohl) Müll.Arg. Stinca, A., D'Auria, G. & Motti, R. (2014). Manihot esculenta (Euphorbiaceae), a new alien species in Italy Hacquetia 13: 355-357. Chakrabarty, T. & Balakrishnan, N.P. (2009). The family Euphorbiaceae in Sikkim state, India Journal of Economic and Taxonomic Botany 33: 483-539.
van Welzen, P.C. & Chayamarit, K. (2007). Flora of Thailand 8(2): 305-592. The Forest Herbarium, National Park, Wildlife and Plant Conservation Department, Bangkok. Inst. Rei Herb. 1: 167 (1766). Troupin, Fl. Rwanda 2: 232, t. 70., fig. 2 (1983). D. Rogers & Appan, Fl. 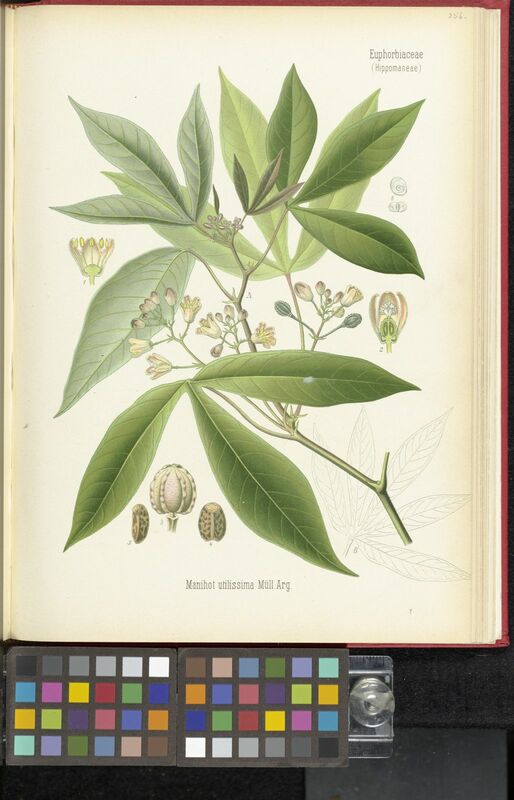 Neotrop., Monogr. 13: 25 (1973). F. White, Forest Flora of Northern Rhodesia p. 201 (1962). J. Léonard, Flore du Congo Belge et du Ruanda-Urundi, 8(1): 121 (1962). Keay, Flora of West Tropical Africa, ed. 2, 1: 413 (1958). F. W. Andr., The Flowering Plants of the Anglo-Egyptian Sudan 2: 86 (1952). J.P.M. Brenan, Check-lists of the Forest Trees and Shrubs of the British Empire no. 5, part II, Tanganyika Territory p. 219 (1949). Crantz, Inst. Rei Herb., 1: 167 (1766).